We buy and sell quality used phones and tablets! Device repair services don’t have to break the bank. We want you to be confident that you’re getting quality service at a fair price. Our repairs are competitively priced, and we stand behind our work. Contact us or drop in today for a free estimate. Water damaged phones however will require a small diagnostic fee. Being without a phone is inconvenient and frustrating, and we can eliminate most of that frustration, with most of our repairs being performed in under a half hour. You can walk in for a same day repair for most phones – or you can contact us to schedule an appointment and have confidence that you will be in and out with no wait. Our inventory is stocked with parts for hundreds of repairs including Apple, Samsung, LG, Motorola, and more. On the chance we do not have your device’s part in stock, we offer fast and reliable shipping options for all special orders. You only want trusted technicians working on your electronic devices. Our highly skilled staff of technicians are trained experts will get your device working like new. We strive to provide excellent customer service, giving you the confidence that your phone or table repair. We only use tested and proven high-quality parts. However, if our repair does not meet your expectations, we offer a 30-day hassle-free warranty. 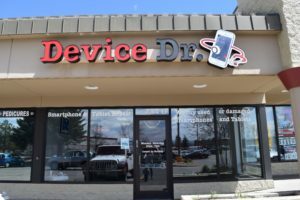 Device Dr. is committed to serving Castle Rock and the surrounding areas with a phone repair and refurbished phone re-sell shop that you can trust and rely upon. We understand the frustration of being without a phone for even a short period of time, and our goal is to bring your ailing smartphone or tablet back to good health as efficiently and quickly as possible. We focus on customer service and stand behind our parts and repairs offering you a limited 30-day warranty on all repairs. See more on the Repairs page. Cell phones are expensive, and the days of the free phone are gone. If you are looking for an alternative to spending $800 on a new smartphone, or incurring months of payments, Device Dr offers refurbished phones for sale, with a warranty to give you peace of mind. See more on the Buy, Sell, Trade page. Called around for prices and how long it would take to change my iPhone plus cracked screen. This place was 20.00 under everyone else and 30 minutes less time to fix it. WOW! Dropped off and walked around for 10 minutes, came back and it was fixed. 15 minutes just like he said it would be! I would go back and I recommend highly! I had my s6 screen replaced yesterday took about 20 mins. Cheapest quote for my phone that I received from 10 different phone repair places since Samsung parts are more expensive very happy with price, speed, and quality my phone is like new again and they back it up with a warranty. So that’s awesome, glad I know I’ve found my doctor.